Friday June 19, 2009: Derry, New Hampshire – HomeAdditionPlus.com announced today its latest product in its home repair Ebook series, the “Patching Wood Siding” Ebook. The “Patching Wood Siding” Ebook is the perfect instructional guide for the do-it-yourself homeowner who needs to quickly and properly repair a damaged section of wood home siding, and wants to save a small fortune on contractor costs. Though patching wood siding clapboards is not an art, it does require some upfront knowledge in order to prevent additional siding damage to the clapboards surrounding the patch area. In addition, it is important that the necessary steps are taken to prevent water infiltration around the wood siding patch. 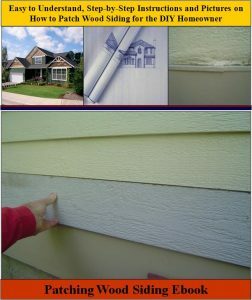 The “Patching Wood Siding Ebook” is immediately downloadable from www.HomeAdditionPlus.com and provides easy to understand, step-by-step instructions, on how to remove damaged wood siding clapboards and replace them with new ones. In addition, it includes 20 instructional pictures. Authored by Mark Donovan, a veteran home improvement carpenter and writer, the “Patching Wood Siding” Ebook provides in-depth explanations and tips on how to properly remove and replace damage wood siding clapboards, so that the DIY homeowner achieves a quality finished clapboard siding patch. It also describes how to remove cut siding nails and protect the patched clapboards from water infiltration by caulking in strategic places on and around the patched clapboards. Most importantly the Ebook helps explain how not to damage the surrounding clapboards to prevent the patch from turning into a larger project than planned and having to hire a siding contractor. The “Patching Wood Siding” Ebook is priced at $15 and can be purchased online at Patching Wood Siding Ebook and is immediately downloadable.